Heating - artificial maintenance in cold weather permanent, given level of air temperature indoors. The amount of heat supplied to heating devices, should be equivalent to the loss of heat through an external protection areas and through ventilation. Heating should provide a comfortable level of air temperature (see comfort Zone, Microclimate). Heating appliances should ensure adequate and uniform heating of the air space and must not pollute the air combustion products. The temperature difference in the horizontal direction from Windows to the inner walls should not exceed 2 degrees vertically - 1 degree for every meter of the height of the room. Temperature of heating surfaces of heating appliances to avoid burning them to settle on from indoor air organic dust should not exceed 80 degrees. The heating surfaces should be smooth, easy to clean from dirt. Operation of heating appliances should not pollute the environment. Local heating appliances should be economically sound and fire-safe. There are local heating radiators and Central heating systems. 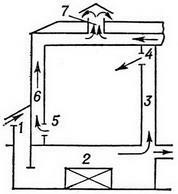 The design of the furnace local heating determines its ability to accumulate more or less heat (heat capacity). For heating of residential and public buildings should apply high thermal capacity of the furnace. The oven medium heat will be used for different heating of premises of temporary stay of people. General shortcomings of stove heating are: non-uniform temperature distribution in the heated environment, the difficulty of controlling heat transfer, indoor pollution fuel and the possibility of contamination of the air space of the combustion products, including carbon monoxide. To a greater extent meet the hygienic requirements of the Central heating system, characterized by the fact that the maintenance of required temperature in the building is one, Central, generator heat, where the fuel consumption or transformation of electricity into heat. The heating medium (steam, water, air) goes to heating devices or to premises on heat pipes (pipes or channels). Fig. 1. 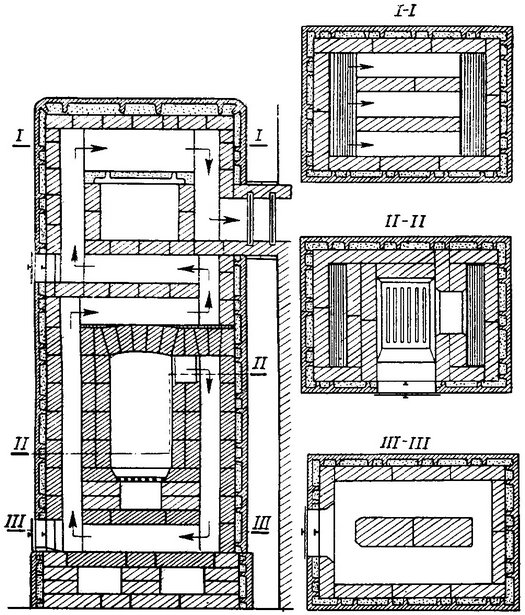 Combined steam-water system (scheme): 1 - steam boiler; 2, 5, 7 and 8 - pipelines; 3 - heat exchanger (boiler); 4 - coil; 6 - heating devices; 9 - expansion vessel. In accordance with the range distinguish apartment or house Central heating system. Recently gained wide use district heating with a big radius of action, and district heating - heat supply from stations that produce heat and electricity. These stations are referred to as combined heat and power plants (CHP). Water heating can be high or low pressure. Because the temperature of the heating surfaces of heating devices of systems of water heating of a high pressure and steam heating limits, these systems are only used for space heating short stay of people and some trading and industrial premises, although steam heating is more profitable in economic terms. Often apply system of water heating of low pressure, in which the steam is used to heat water in heat exchangers (heaters) (Fig. 1). Fig. 2. Air heating (scheme): 1 - receiver outdoor air; 2 - heater; 3 - inlet channel; 4 - submission in a premise; 5 - air removal; 6 - exhaust channel; 7 - mine. Air heating of residential and public buildings can be used for simultaneous air-conditioning and prevention of transitions air from one premises to other (Fig. 2). Meets hygienic requirements radiant (panel) heating, in which a heating device is laid in the walls or the floor. Heating. The temperature is one of the main factors in complex meteorological conditions that determine the heat transfer and thermal balance of the body and the external environment, so providing thermal comfort (see Area of thermal comfort in residential and public buildings is an important sanitary objective. Heating systems of buildings must meet the following hygienic requirements: 1) to provide indoor sustainable temperature depending on the climate at the level of 17-22 degrees (permitted fluctuations not more than + 2 degrees during the day); 2) to promote uniform distribution of air in premises (oscillations in a horizontal direction allowed not more than + 1 degrees, the temperature increase in the vertical direction for every meter of the height of the room is no more than 1.5 degrees); 3) not to spoil the composition of air in premises, such as the burning dust on the surface of heating devices (which sharply increases at temperatures above 85 degrees), and also the allocation of carbon monoxide and other harmful and evil-smelling gases; 4) prevent mechanical impurities premises fuels, ashes and so on; 5) to be easily accessible for maintenance and cleaning of its basic elements (heat generator, heating devices, pipelines, channels, air heating and other). Listed hygienic indicators systems is largely determined by the degree of centralization, the nature of the heat-carrier (water, steam, air) and the heat energy transferred heating devices (convection and radiant heat). Fig. 1. The device turn the heating furnace of the large heat capacity. Fig. 2. Double-pipe scheme Central heating with upper water distribution: 1 - boiler; 2 - the main strut; 3 - planting highway; 4 and 5 are hot and return struts; 6 - a return line; 7 - heating devices; 8 - regulating valves; 9 - a broad tank; 10 - pipe to exhaust air; 11 and 12 water pipes. Local heating - stove (Fig. 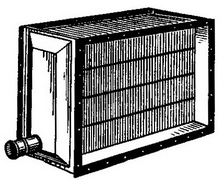 1), as well as electric, gas - comfortable and easy to maintain, however, have a number of disadvantages: the uneven air temperature indoors during the day; the presence in a heated premise negative radiation, mostly from the exterior walls and Windows; a relatively high temperature on separate sites of a surface of heating devices, causing the burning of dust and a deterioration in the composition of the air in the premises; indoor pollution when using a wood-burning furnace fuel, ash, smoke, etc. 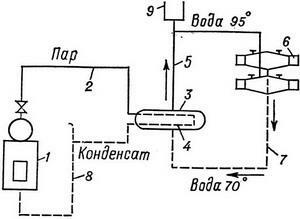 ; the difficulty of controlling the heat emission of heating surfaces; risk allocation in some cases, harmful gases (e.g. carbon monoxide in flue systems). In addition, many of heating devices for local heating (metal and small capacity of the brick or ceramic stoves, heaters) require continuous work in connection with the small heat capacity. right - heating element of the convector. Central system of O. (water, steam, air, water radiant, air-rayed and others) offer significant advantages: provide indoors more uniform thermal regime, are not contaminated by combustion products and fuel and other Most common Central water systems (Fig. 2)who are the best hygienic indicators can serve separate apartments, buildings and whole regions. The temperature of the water circulating in these systems, does not exceed 95 degrees, which provides surface heating elements - radiators, convectors (Fig. 3) the temperature does not exceed 80-85 degrees. The use of systems in which the coolant coming in heating devices, serves as pairs of low or medium pressure (up to 0.7 at), only allowed in public premises due to the high temperature (above 100 degrees) of a surface of heating devices. Recently in residential and public buildings spread modernized air heating systems, in which the coolant is heated in fan heaters and humid outside air (Fig. 4). Heated up to 50-60° air enters the upper zone of heated space network of channels. He simultaneously performs the functions of the ventilation fresh air, replacing the air removed by exhaust centers located in kitchens, sanitary units and so on, Recirculated air mode when the system is not allowed due to hygienic reasons. All these systems are mostly convection. In hygienically deserve greater attention from the system radiant Acting, in which low-temperature radiant heat is 70-80% of the total amount of heat emitted. Radiant heating system causes other conditions of microclimate (see) in the premises and has on the human body action, other than observed in convection system. Radiant energy in the certain limits has a very beneficial effect on the body (General-stimulating effect, increased metabolism and so on). This mainly is hygienic advantage radiant heating systems. Heating devices such systems are on the floor, the ceiling, or the internal or external walls and have moderate temperatures on the surface. At radiant heating system reduces the negative radiation from external barriers, providing comfortable conditions at a lower temperature than in case of convection systems (for example, 17-18° instead 18-20 degrees and in residential areas). The surface temperature radiant panels Acting in a residential area is taken: for outdoor panels 26-28°, ceiling 30-35°, for the wall of 35-40 degrees (depending on location), to the sill panels 45-50 degrees. The excess of the specified temperature causes thermal discomfort.